There will be a rematch of last year's championship in the semifinals of the 2019 U Sports Final 8 men's basketball tournament. 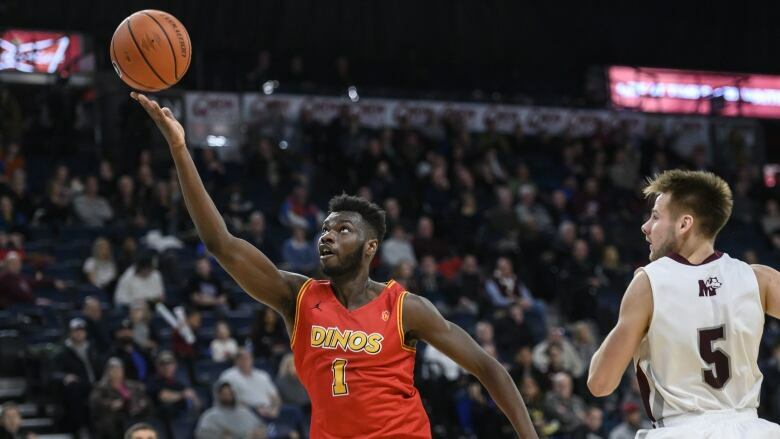 The reigning champion Calgary Dinos, seeded second, will square off against the No. 3 Ryerson Rams on Saturday after both recorded quarter-final wins on Friday. The Dinos, unbeaten in regular-season and playoff action this year (26-0), survived a scare on Friday. Calgary wiped out a five-point halftime deficit to beat the Saint Mary's Huskies 94-78. The Dinos outscored the No. 7 Huskies of Halifax 28-10 in the third quarter to take command. "I am pleased with how we responded in the second half," Dinos coach Dan Vanhooren said. "I told our players to be themselves — we were playing too safely. We gave Saint Mary's too much in the paint and their shooting percentage was too high (in the first half)." Brett Layton led the Dinos with 23 points, going 10-of-16 from the field. Mambi Diawara added 17 points and 11 rebounds, while Lars Schlueter had 16 points and 10 rebounds. Kemar Alleyne led the Huskies with 20 points. The Dinos shot 52.9 per cent from the field, well above the Huskies' 38.2 per-cent clip. Calgary also outrebounded Saint Mary's 28-18. "They picked up their intensity on the defensive end in the second half," Huskies coach Jonah Taussig said. "I don't think they necessarily did anything differently, but what they wanted to do, they did a little bit better." Calgary beat Ryerson 79-77 in the final last year on a layup by Diawara in the final seconds. The Rams cruised to victory after outscoring the Stingers 26-6 in the opening quarter. Four players scored in double figures for the Toronto school, led by Warsame Mohamed with 15. He also had nine rebounds. Myles Charvis had 14 points and nine rebounds for Ryerson. Concordia was just 3-of-36 (8.3 per cent) from three-point range, while Ryerson was 11-of-22 (50 per cent). "We knew they were good (at shooting threes) at that and we worked really hard — we were locked in, for the most part," Rams coach Roy Rana said. Adrian Armstrong topped Montreal's Stingers with 19 points. "I think their length, on defence, bothered us, and we also missed a lot of open shots early on," said Concordia head coach Rastko Popovic. The 13-time national champion Ravens used a 33-point second quarter to get past the Golden Bears. Isiah Osborne scored 20 points while Eddie Ekiyor added 19 for Carleton. Brody Clarke paced Alberta with 12 points. Carleton had won seven national championships in a row before falling in the semis last year. The Tigers held the Thunderbirds to just 18 first-half points and took a 15-point lead into the break before dispatching their opponent to set up a meeting with Carleton. Alex Carson had a team-high 17 points while Sascha Kappos chipped in 15 points and nine rebounds for Dalhousie. Grant Sheppard had a game-high 26 points and 12 boards for UBC. Dalhousie has never won a national title, with a third-place finish in 2017 being its best finish.